For many women, part of dreaming about the future includes visions of a beautiful engagement ring being placed upon their finger by a special someone. You know, a physicalring that can be taken on and off whenever you choose. Or not. The newest engagement trend out there includes diamonds but has nothing to do with rings. Some women are choosing to get their engagement diamonds embedded into their ring fingers by way of a piercing. And this is exactly why millennials can't have nice things. Behold the newest engagement trend of 2018. 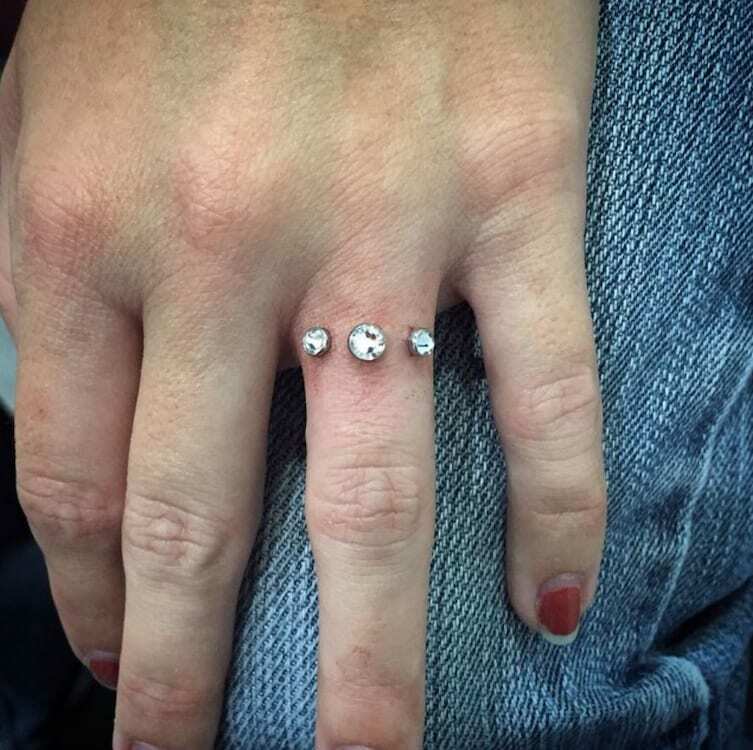 Although I prefer the term "finger diamonds," this trend actually consists of a dermal piercing (also known as a microdermal or single-point piercing) with an anchor made of titanium or gold which holds the diamond. According to the Association of Professional Piercers, "When properly performed by a skilled practitioner, a surface anchor piercing is no more risky than an ordinary body piercing and takes no longer to perform or to heal." However, according to professional piercer Adrian Castillo, "The rejection rate is very high and the scarring can be pretty bad. They sit on the surface of the skin so they are very prone to getting snagged." The entire process reportedly takes around 10 minutes and costs around $100 for the piercing. However, this obviously doesn't include the price of the diamond, which has to be provided by the customer. So it's more painful, permanent, and expensive than a normal engagement ring? I think I'll pass. Dermatologist Dr. Monica Halem has some concerns about this new trend. "First of all, these procedures are not being done by a doctor, and it is a surgical procedure," she said. "There are a lot of important structures that sit right under the skin there that can easily be damaged, like tendons." I don't know about you guys, but I think I'll stick with a traditional engagement ring. That is, if anyone is wild enough to marry me one day. What do YOU think of this new engagement "ring" trend? Leave a COMMENT and let us know.